So, I've saved the best for last. Day three of the cherry-palooza going on in my kitchen has to mean pie. When the folks at OXO and North West Cherry Growers issued their cherry challenge and sent us a bounty of ripe fruit, it was fun to think creatively about cherry recipes. And the brandied cherries I made on Wednesday are definitely fun. Yesterday's cherry preserves might be more typical but they sure are tasting good slathered on pretty much everything! Is a pie, then, too normal, too expected? The truth is, I didn't really care because I absolutely had to have it. There needed to be pie! I was tempted to try my hand at a fussy lattice top but, in the end, I'm just not a fussy kind of baker. And you all should know by now that I believe every dessert could benefit by crumb topping. 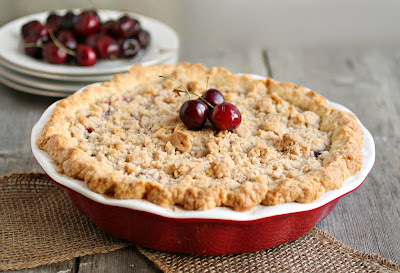 So I used my over-sized pie plate and created a deep dish, crumb topped pie that's bursting with fresh cherries. And I'll say this - if it's possible for a cherry pie to taste better than this, I haven't met it yet. Enjoy! To make the crust, combine the butter, flour, baking powder, salt and sugar in a food processor with a steel blade and pulse just until it resembles course crumbs. Slowly pour in the ice water and pulse just until combined and a dough ball forms. Wrap the dough in plastic wrap and refrigerate for at least one hour. 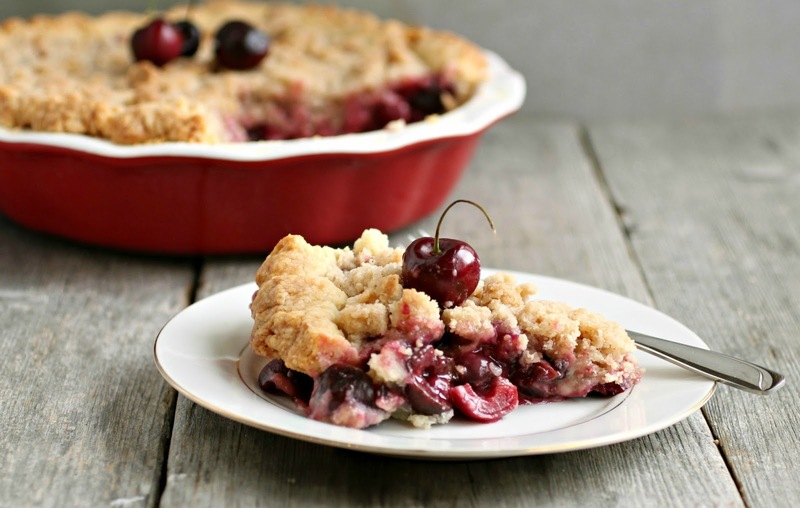 To make the filling, combine the cherries in a bowl with the sugar, lemon juice, flour, zest and salt. As you mix you'll notice quite a bit of liquid puddling in the bottom of the bowl. Strain the mixture into a colander before placing in the pie shell. To make the crumb topping, combine the sugar, cinnamon, flour and salt in a bowl or food processor. Cut in the butter until the mixture is crumbly and set aside. After the dough has chilled, roll it out on a well-floured surface into about a 12" circle. Place in a 10" pie dish and crimp the edges. Pour the cherry mixture into the dish. Cut the tablespoon of butter into several pieces and dot the top of the filling. Using your hands, crumble the topping over the pie so that small and large clumps form. Place the pie dish on a sheet pan (to catch drips) and bake in a pre-heated 350 degree oven for about 50 minutes or until the top is a light golden brown. Allow the pie to cool completely before slicing. Makes approximately 10 servings. Note that I was invited to participate in the 10lb. Cherry Challenge. North West Cherries sent me the fruit and OXO provided some baking tools to help with the challenge. I received no other compensation and my opinions and recipes are my own. I love crumb topped pie! So yummy looking and I will go over Sunday and vote! Oh yes...now THIS is what I'm talkin' 'bout! Crumb topped pies are the best! An ooooohhhhh cherry pie too. I could almost go face down into this one. Almost. But I think a fork would be better. 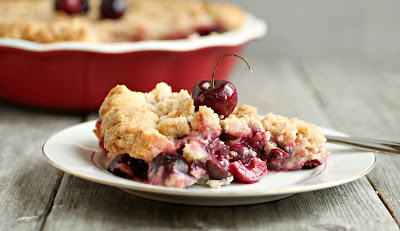 Oh my gosh, I don't think my summer will be complete until I make a cherry pie! Love your crumb-topped deep dish version! We take a big slice with some ice cream please!